You can enable one or more options for your organization. When you enable home folders for an AppStream 2.0 stack, users of the stack can access a persistent storage folder during their application streaming sessions. No further conﬁguration is required for your users to access their home folder. Data stored by users in their home folder is automatically backed up to an Amazon Simple Storage Service bucket in your AWS account and is made available to those users in subsequent sessions. Files and folders are encrypted in transit using Amazon S3's SSL endpoints. Files and folders are encrypted at rest using Amazon S3-managed encryption keys. As an administrator, use the applicable path if you configure your applications to save to the home folder. In some cases, your users may not be able to find their home folder because some applications do not recognize the redirect that displays the home folder as a top-level folder in File Explorer. If this is the case, your users can access their home folder by browsing to the same directory in File Explorer. Check that you have the correct AWS Identity and Access Management (IAM) permissions for Amazon S3 actions. For more information, see IAM Policies and the Amazon S3 Bucket for Home Folders and Application Settings Persistence. Use an image that was created from an AWS base image released on or after May 18, 2017. For a current list of released AWS images, see AppStream 2.0 Base Image Version History. Enable network connectivity to Amazon S3 from your virtual private cloud (VPC) by configuring internet access or a VPC endpoint for Amazon S3. For more information, see Networking, Access, and Security for Amazon AppStream 2.0 and Home Folders and VPC Endpoints. You can enable or disable home folders while creating a stack (see Create a Stack), or after the stack is created by using the AWS Management Console for AppStream 2.0, AWS SDK, or AWS CLI. For each AWS Region, home folders are backed up by an Amazon S3 bucket. The first time you enable home folders for an AppStream 2.0 stack in an AWS Region, the service creates an Amazon S3 bucket in your account in that same Region. The same bucket is used to store the content of home folders for all users and all stacks in that Region. For more information, see Amazon S3 Bucket Storage. Follow the steps in Create a Stack, and make sure that Enable Home Folders is selected. In the left navigation pane, choose Stacks, and select the stack for which to enable home folders. Below the stacks list, choose Storage and select Enable Home Folders. In the Enable Home Folders dialog box, choose Enable. Users who are connected to active streaming sessions for the stack receive an error message. They are informed that they can no longer store content in their home folder. Home folders do not appear for any new sessions that use the stack with home folders disabled. Disabling home folders for one stack does not disable it for other stacks. Even if home folders are disabled for all stacks, AppStream 2.0 does not delete the user content. To restore access to home folders for the stack, enable home folders again by following the steps described earlier in this topic. Follow the steps in Create a Stack and make sure that the Enable Home Folders option is cleared. In the left navigation pane, choose Stacks, and select the stack. Below the stacks list, choose Storage and clear Enable Home Folders. In the Disable Home Folders dialog box, type CONFIRM (case-sensitive) to confirm your choice, then choose Disable. Where region-code is the AWS Region code in which the stack is created and account-id-without-hyphens is your AWS account ID. The first part of the bucket name, appstream2-36fb080bb8-, does not change across accounts or Regions. For example, if you enable home folders for stacks in the US West (Oregon) Region (us-west-2) on account number 123456789012, the service creates an Amazon S3 bucket in that Region with the name shown. Only an administrator with sufficient permissions can delete this bucket. As mentioned earlier, disabling home folders for stacks does not delete any user content stored in the Amazon S3 bucket. To permanently delete user content, an administrator with adequate access must do so from the Amazon S3 console. AppStream 2.0 adds a bucket policy that prevents accidental deletion of the bucket. For more information, see IAM Policies and the Amazon S3 Bucket for Home Folders and Application Settings Persistence. You can provide offline access to user data for your users with Amazon S3 policies. For more information, see Allow Users to Access a Personal "Home Directory" in Amazon S3. You can enable file versioning for content stored in Amazon S3 buckets used by AppStream 2.0. For more information, see Using Versioning. When home folders are enabled, each user is provided with one unique folder in which to store their content. The folder is created and maintained as a unique Amazon S3 object within the bucket for that Region. The hierarchy of a user folder depends on how the user launches a streaming session, as described in the following sections. Where bucket-name is in the format shown in Amazon S3 Bucket Storage and user-id-SHA-256-hash is the user-specific folder name created using a lowercase SHA-256 hash hexadecimal string generated from the UserId value passed to the CreateStreamingURL API operation or create-streaming-url command. For more information, see CreateStreamingURL in the Amazon AppStream 2.0 API Reference and create-streaming-url in the AWS CLI Command Reference. You can identify the folder for a user by generating the lowercase SHA-256 hash value of the UserId using websites or open source coding libraries available online. In this case, user-id-SHA-256-hash is the folder name created using a lowercase SHA-256 hash hexadecimal string generated from the NameID SAML attribute value passed in the SAML federation request. To differentiate users who have the same name but belong to two different domains, send the SAML request with NameID in the format domainname\username. For more information, see Single Sign-on Access to AppStream 2.0 Using SAML 2.0. When part or all of the NameID string is capitalized (as the domain name SAMPLEDOMAIN is in the example), AppStream 2.0 generates the hash value based on the capitalization used in the string. Using this example, the hash value for SAMPLEDOMAIN\testuser is 8DD9A642F511609454D344D53CB861A71190E44FED2B8AF9FDE0C507012A9901. In the folder for that user, this value is displayed in lowercase, as follows: 8dd9a642f511609454d344d53cb861a71190e44fed2B8aF9fde0C507012a9901. You can identify the folder for a user by generating the SHA-256 hash value of the NameID using websites or open source coding libraries available online. You can enable and disable home folders for a stack by using the AWS CLI or AWS SDKs. Use the following command to disable home folders for an existing stack. This command does not delete any user data. To help your users understand how to work with home folders, you can provide them with the following information. Open and edit files and folders that you store in your home folder. Content that is stored in your home folder is specific to you and cannot be accessed by other users. Upload and download files between your local computer and your home folder. AppStream 2.0 continuously checks for the most recently modified files and folders and backs them up to your home folder. When you are working in an application, you can access files and folders that are stored in your home folder. Choose File Open from the application and browse to the file or folder that you want to open. 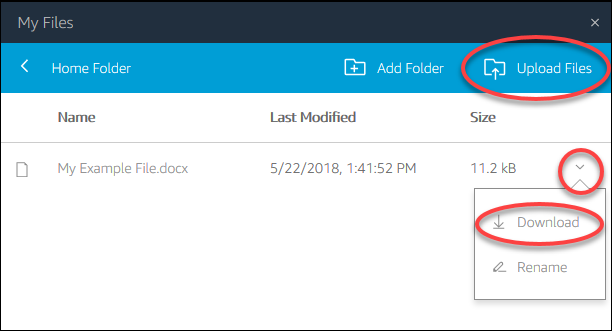 To save your changes in a file to your home folder, choose File Save from the application interface, and browse to the location in your home folder where you want to save the file. You can also access your home folder by choosing My Files from the web view session toolbar. If your home folder doesn't appear, view your home folder files by browsing to the following directory in File Explorer: C:\Users\PhotonUser\My Files\Home Folder.